This update focuses a lot on cleaning up the UI and existing functions as we really want TTS to look nice and clean. If you come across any funny looking bugs be sure to post them on our forums. Have suggestions for new features you’d like to see? Then post them either on our official forums or in the latest pinned thread on our sub-reddit. You can now use the new Orthographic camera. This keeps the camera locked in top down 2D view. This is great for games that require more of a top down view or for placing down and aligning objects perfectly. Press P to toggle between the camera modes or right click on a non-object to bring up the Global Contextual Menu. Orthographic camera so everything is perfectly flat and readable at any angle. You can now see objects as they are supposed to be. It will use the entire screen if it’s supposed to. This now works on animated objects and the 3D UI. Added Spotlight section on the Main Menu for any relevant news, updates & community spotlights. 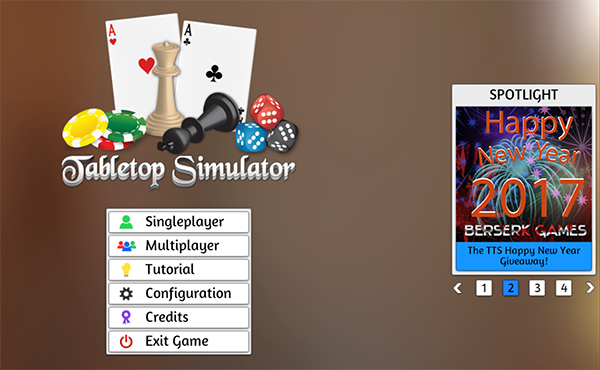 Updated the Main Menu and Multiplayer sections to fit with new UI. Improved sharpness of sprites throughout the UI. There are a still a lot more updates that need to be done. Fixed issue with cards in new decks not being given a unique GUID. Fixed scripting exploit to spawn objects when they are destroyed. Fixed not cleaning up Lua coroutines properly. Sorting in the Games menu will now save between sessions. Games Menu will not forget search term when reloading the UI after expanding mods & saves. Fixed issue when resizing the game wouldn’t update video / loading image size. Fixed load screen for 21:9 aspect ratio. Improved all 3D object previews. Optimized physics sleep settings for better performance. Objects are now highlighted the player color when they do any functions – scaling, rolling, color tinting, under, locking, etc. This will allow you to see who are doing things when they aren’t supposed to. You can now load custom tables when expanding a mod. You can now expand and load custom backgrounds from the Workshop. Improved protection against corrupt player prefs. Added safe guard for objects falling forever if colliders are lost. Better error handling when saving long name URLs to disk. Added mouse scrolling to the Games Menu so you can use your scroll wheel to quickly scroll through the pages, as well as on the front menu with the categories. Moved Saved Slot number to the top left of thumbnail instead of in the name to give more space for the text. Saved objects added to Objects menu in the top bar, so you no longer need to go to the Chest to access it. Added confirmation button when loading a save to prevent accidental missclicks. Added a /debug command to highlight objects red that are moving. Great for tracking down objects that are causing network and physics overhead. Fixed UI issues with the mp3 player. Found lost card (Solar Engineering) inside the table and added it to the Research deck for Darkrock Ventures DLC. Fixed issue with building cards locking into place upside-down in Tiny Epic Western. Fixed issue with the possibility of DLCs breaking when changing from one DLC to another. Fixed having to exit to main menu when having a DLC breaking loading. Fixed custom token not resizing correctly with more than one in save expand or bag search. Fixed expand save / bags not working correctly on old cjc files. Fixed issue with closing a custom model menu that hasn’t loaded correctly not being properly deleted. Fixed issue with Tooltips being behind elements. Fixed issue where the camera spins like crazy when pressing space when at 0. Fixed spectator error message when they try to move a piece. Fixed issue with Ellipse … text not wrapping correctly. Fixed deck override sideways property on card. Fixed locked object in deck / bag. Fixed issue with Games Menu not refreshing correctly when you save as Promoted. Fixed pixel paint drawing not loading between saves. Fixed create folder and saved objects appearing behind the UI. Fixed tooltip getting stuck on the tools menu.